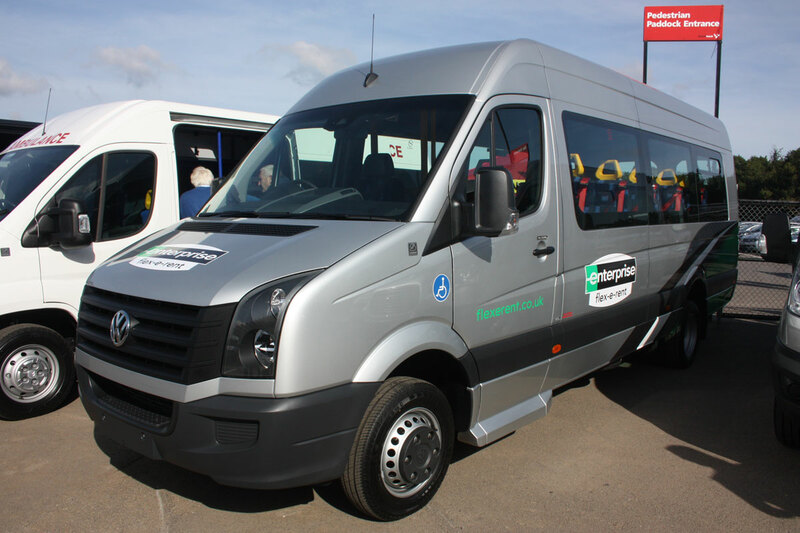 One of three different 16-seat wheelchair accessible Mercedes-Benz Sprinters built for London Hire. Note the revised fold out entrance step and the attractive in-house moquette. The seats are Rescroft CT-Space units. 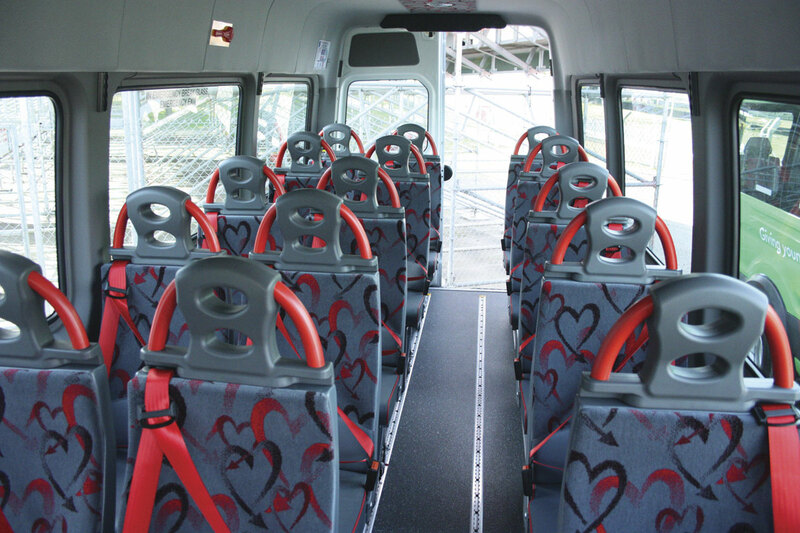 The interior of the 16-seat wheelchair accessible London Hire Sprinter. An attractive Ford Transit converted for Hampshire County Council. It has seating for 14. Note the extra entrance steps to both the cab and saloon. 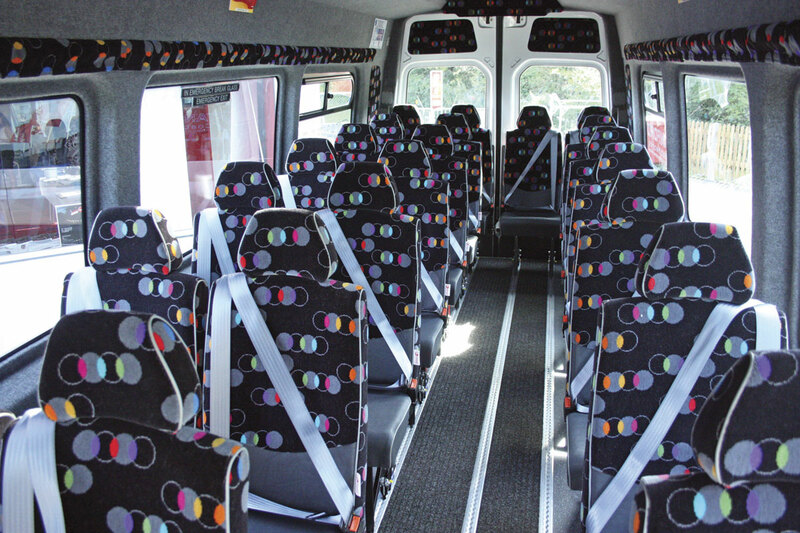 The interior of the Hampshire County Council Ford Transit. 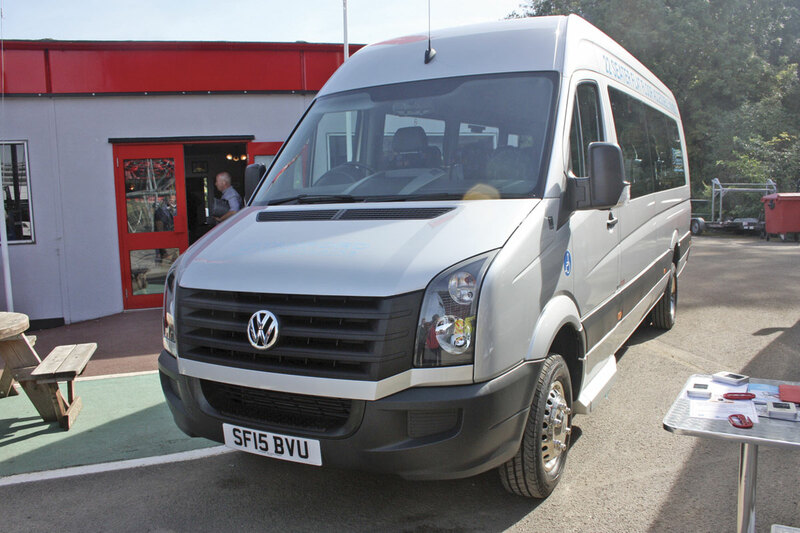 The new 5.3 tonnes GVW 22-seat wheelchair accessible conversion of the VW Crafter CR50. The interior of the GVW 22-seat wheelchair accessible conversion of the VW Crafter CR50. The NMI SitSafe which allows an infant to be carried safely on a long distance coach with the child alongside and facing the parent. 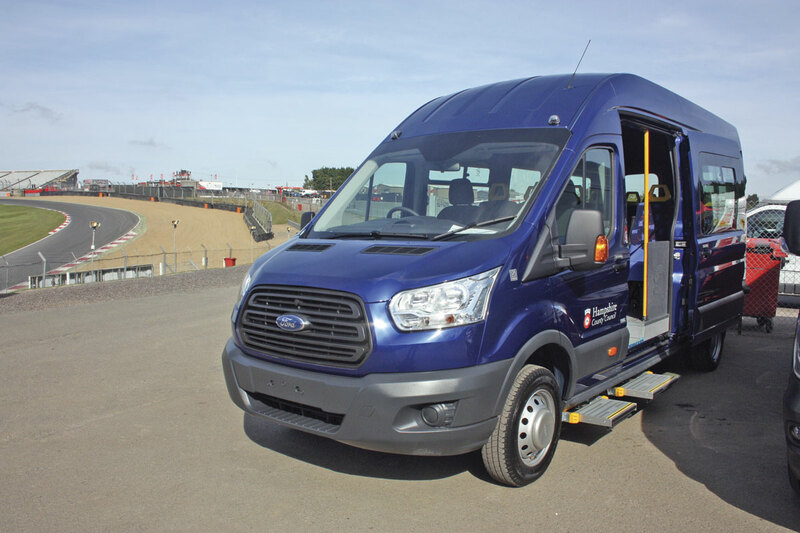 Ford Transit conversion for Enterprise Flexerent with seating for eight was fitted with a PLS in-board tail lift. A new VW T5 Transporter motor home alongside a Transit motor home that Stanford converted from a 1969 Mark 1 Transit to commemorate their 20 years of converting vehicles. Sumptuous luxury in a Mercedes-Benz Sprinter 516 Monaco minicoach. It seats just eight! 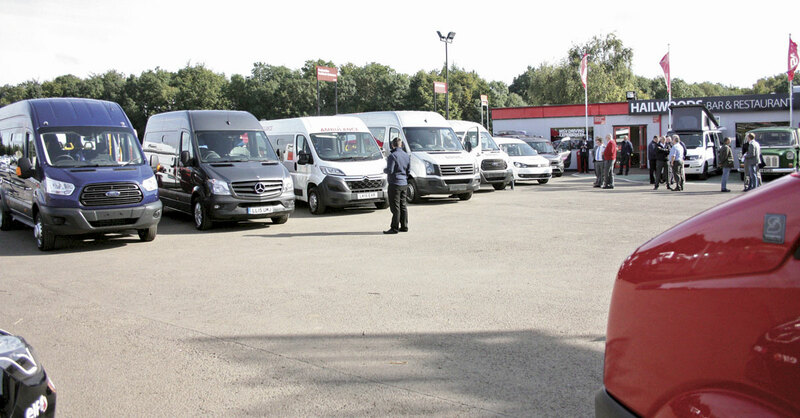 Regular Stanford customers, the Lords Taverners, generally specify the Ford Transit. This unit can carry 15 passengers or up to three wheelchairs. A VW Crafter CR50 accessible vehicle conversion with seating for 15 or, alternatively, four seated passengers and five wheelchairs. This VW Crafter CR50 for Enterprise Flexerent fitted with 16 Phoenix Blenheim seats can alternatively carry three wheelchairs with six seated passengers. 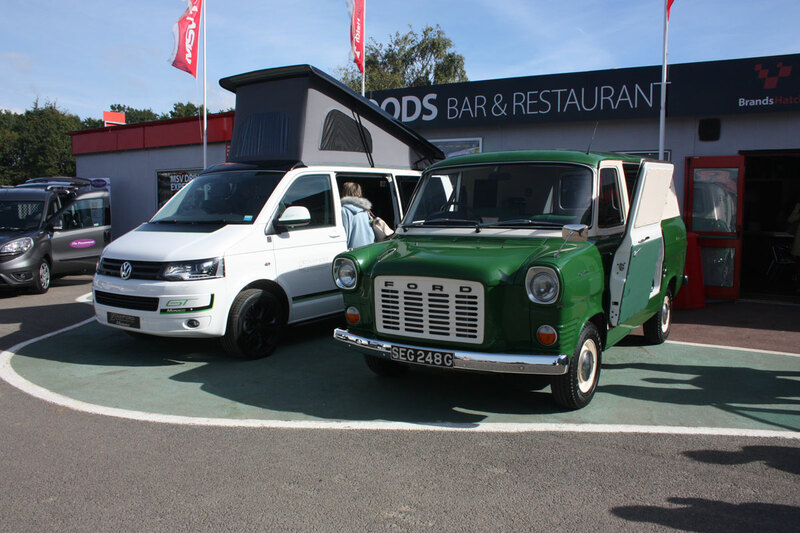 Stanford Coachworks, which earlier this year celebrated its 20th anniversary, again staged its own Expo at the now familiar venue of the Brands Hatch Racing Circuit in Kent. As previously, the event was very well attended and Stanford directors, Lee Wiggins and Jess Rider, put on an impressive display of their coachbuilding skills. 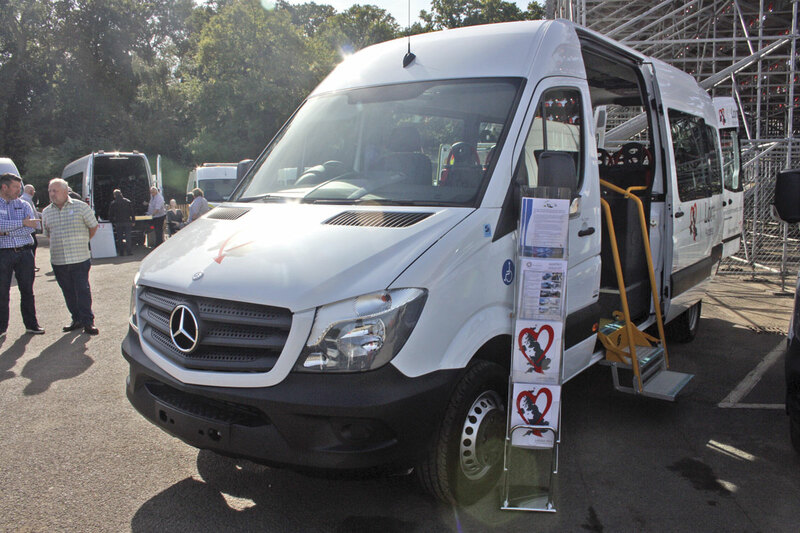 The range of vehicles on show extended across all sizes of accessible minibuses, luxury minicoaches, motor homes and medical support vehicles. Stanford’s bread and butter has always been building practical wheelchair accessible vehicles on a wide variety of chassis. The smallest vehicle on show was a conversion of a VW Caddy Max designed to be accessed by a single wheelchair passenger using an access slope and Portaramp ramp built into the rear of the vehicle. The example on show was one of batch being built for Enterprise Flexerent. Enterprise bought out Burnt Tree Access-a-Bus a year to become one of the country’s largest rental organisations. Sadly they have now dropped the Access-a-Bus name in favour of Flexerent. Alongside the Caddy were two other Enterprise vehicles, a Ford Transit and a VW Crafter CR50. 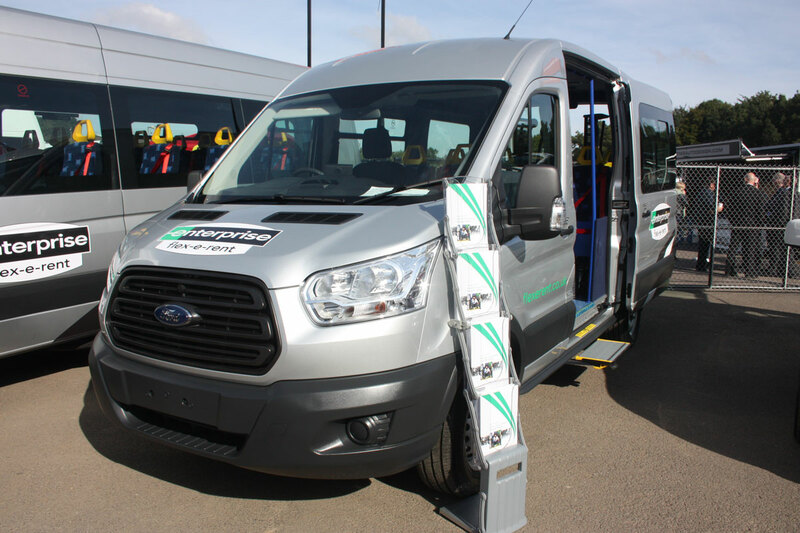 The Ford Transit was fitted with a sliding side entrance with extra step and seating using Phoenix Blenheim units for eight passengers in the saloon or one seated and three wheelchairs. Wheelchairs are loaded through the rear doors using a PLS in-board lift. The VW Crafter had a cab entrance doorway and seating for 16, again using Phoenix Blenheim seats. It can alternatively carry six seated passengers and three wheelchairs, which are loaded through the rear using a PLS underfloor cassette style tail lift. An example of Stanford’s diversification was a PTS ambulance built on a Citroen Relay. This had an extra entrance step at the side entrance which was fitted with a sliding door, seating for eight or alternatively three seated passengers and three wheelchairs. Seating was by Phoenix and wheelchairs were loaded through the rear using a PLS in-board lift. A Mercedes-Benz Sprinter 313 had been specially designed and built for Benjamin Root, a seriously paraplegic young man, adding greatly to his life. It featured quite a luxurious interior with five sumptuous Politecnica seats, a wood effect floor, a sound system, bonded tinted glazing and air conditioning. Benjamin is loaded into the vehicle in his wheelchair through the rear doors using a PLS in-board lift. His family oversaw the production of the vehicle and were full of praise for the attention and care paid by the Stanford team in building the vehicle. More typical of Stanford’s production was a Transit built for Hampshire County Council. This featured additional entry steps to both the cab area and the saloon. It had Phoenix seating for 14 or alternatively four seated and three wheelchairs, which are loaded at the rear using a PLS underfloor cassette type lift. Similar in concept to the Hampshire vehicle was a VW Crafter CR50. This featured a sliding side entrance fitted with Stanford’s fold out extra steps with integral handrails. 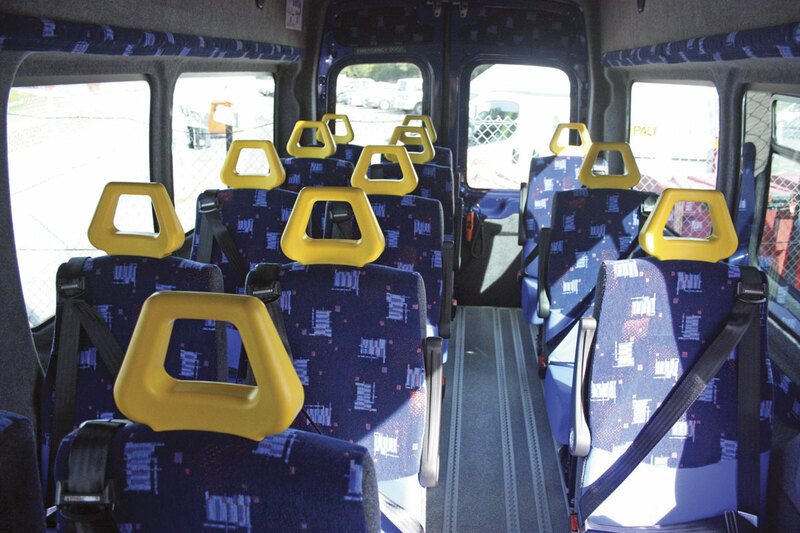 It had 15 Phoenix seats or could carry four seated passengers and five wheelchairs. A PLS underfloor lift enables wheelchairs to be loaded through the rear. 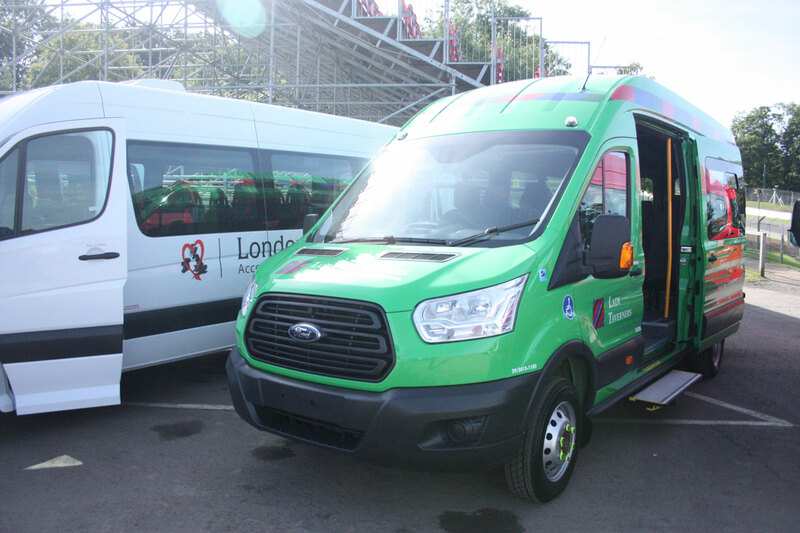 Stanford have been building vehicles for the Lords Taverners charity for years, usually on the Ford Transit. On show was one of the latest batch with sliding side entrance with large extra step, 15 Phoenix seats and a Ratcliff Palfinger rear cassette lift. Alternatively it could be configured with three seated passengers and three wheelchairs. London Hire has been another long-time Stanford customer and they had three vehicles on show produced by the Essex concern. All three were conversions of the Mercedes-Benz 513 Sprinter. One had a cab entrance layout and was fitted with 15 Rescroft CT-Space seats. These were trimmed in London Hire’s very attractive new moquette which uses the company’s colours of grey, red and black and its heart logo. The vehicle could alternatively carry four wheelchairs and four seated passengers. Wheelchair loading was through the rear doors using a PLS underfloor lift. The second vehicle had a sliding side entrance with a new version of Stanford’s fold out step with integral handrails. This new design provides a double platform which extends the step further from the vehicle, sets the initial step at a lower height and makes the entrance much easier to negotiate, especially for the ambulantly disabled. The vehicle was also fitted with a reversing camera and London Hire’s alarm and flashing light system to warn cyclists when the vehicle is turning to the left. Inside it had seating for 15 using Rescroft CT-Space seats or alternatively could carry four seated passengers and four wheelchairs. A rear mounted PLS lift was fitted. This vehicle also has a removable PLS Door Safe unit, something London Hire offer as an option on many of their vehicles. The third vehicle had a powered entrance door, the same fold out step arrangement and the same seating and lift arrangements except it was only fitted with 15 seats or could carry two seated passengers and five wheelchairs. As with all London Hire vehicles, the specification was high including tinted, bonded glazing, air conditioning, soft feel trim and careful lighting. 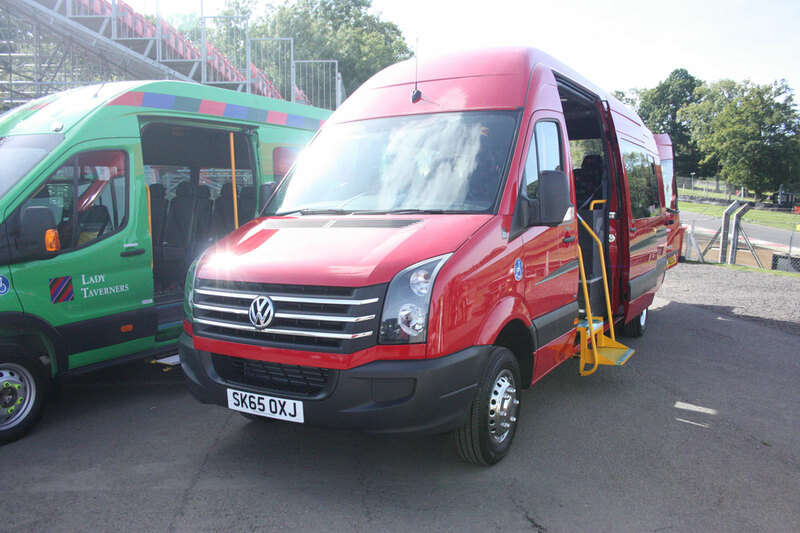 The final vehicle in the accessible section was Stanford’s new VW Crafter CR50 22-seat minicoach. It featured the new Telma AF retarder and has a gross weight of 5.3 tonnes. A cab entrance, Phoenix Sirius seats and a PLS underfloor lift were fitted. It could be converted to carry three seated passengers and six wheelchairs. 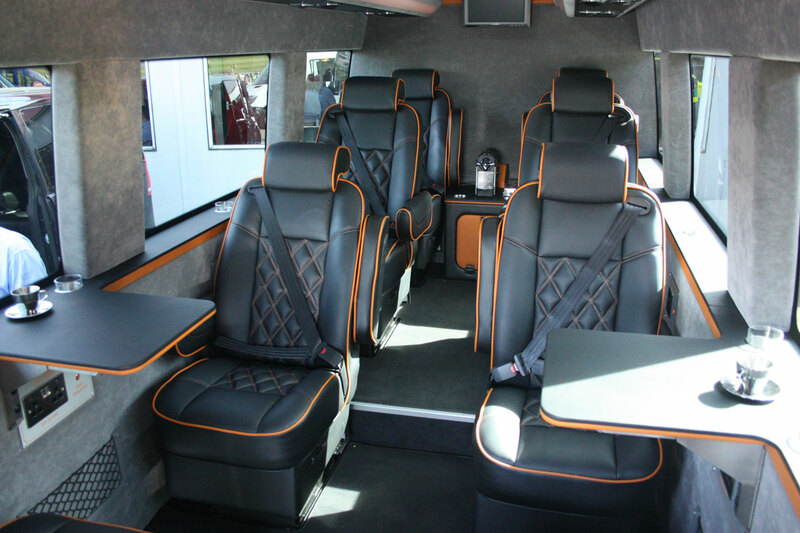 Pride of place went to a Mercedes-Benz Sprinter Monaco luxury minicoach built on a 516 automatic Sprinter. This had a luxury interior with just eight seats trimmed in black leather with gold piping, an integrated table system built into the cills, bonded, dark tinted windows, a comprehensive sound, vision and communication system, abcoffee machine, fridge, racks and air conditioning. It also had an extra step at the entrance and a large boot accessed by a lift up boot door. Another luxury vehicle was built on a T5 VW Transporter base. This had seating for four people in luxurious seats, a comprehensive in-vehicle entertainment and communications package and a fridge. The final luxury vehicle was another VW T5 Transporter, this time converted as a motor home. Alongside it for contrast Stanford showed a motor home converted out of a 1969 Mk 1 Ford Transit. The first vehicle that Stanford’s ever converted was a Ford Transit which they sold to Tilbury Taxis. The directors decided to convert the old Transit into a retro style motor home to celebrate their 20 years in business and it will be used locally to promote the company at events. As usual, the event was very well supported by the supply industry including NMI, Koller, Eberspacher, Ricon, Ratcliff Palfinger, PLS, AMF Bruns, Auto Adapt, A.T.Industries, CTT Accessible Vehicle Training, EMP Technology, Phoenix Seating, Q’Straint, The Procurement Partnership, Stedall, Unwin Safety Systems and Webasto. An item which caught my attention in the supplier section was a seat designed by NMI primarily for long distance coaches. 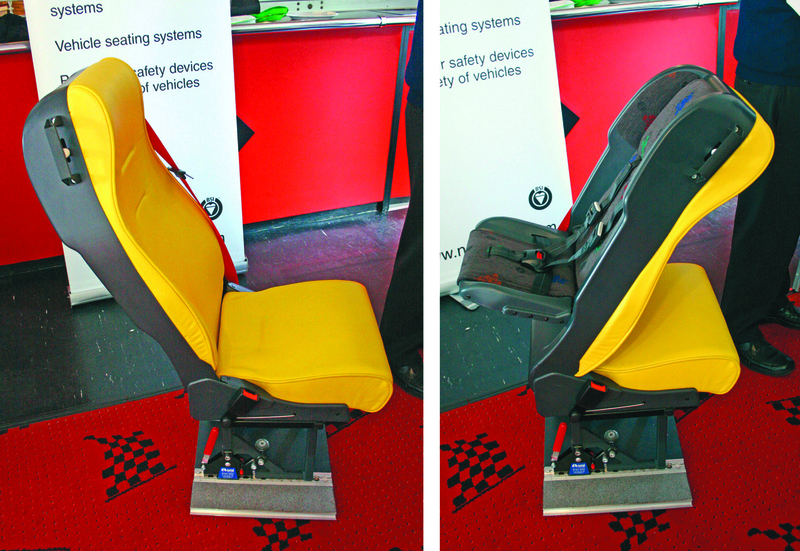 Called the SitSafe it enables a seat to be easily converted (single lever) in order to provide a safety seat for an infant. It allows the child to be carried safely alongside and facing the adult travelling with the child. As a display of the coachbuilding skills of Stanford Coachworks it is difficult to think how it could have been improved and the visitors had plenty to keep them interested. If they tired of looking at vehicles there was always the option to be scared witless by a spin round Brands Hatch driven by Lee Wiggins in his Caterham 7. I passed on that one!